Emily only started karting in early 2016 at the age of 13 in the Brentwood Karting Raceway Development Club in corporate hire karts, where she immediately impressed them with her pace and natural race craft. She was swiftly moved her up to their race academy just three weeks later where she raced against much higher calibre of drivers, from multiple national and regional champions to World Champion’s. She was also awarded ‘The Parents Award for Most Inspirational Driver’ for her meteoric rise. Having shown some great speed and a thirst for learning, she managed to win a many races and finished 9th overall in her first 12 week challenge there, ending up with the 2nd fastest time of the year too. She moved up to open wheel owner driver karts in the Junior Subaru class and once again, we quickly on the pace, winning rookie podiums in her first race and taking three more in her next four races. Having started late in the BMJC Karting Championship, Emily rocked her category by finishing on the podium in every round, and winning the championship title at the end of the year, with the highest points total in both ‘Silverstone’ and ‘Monza’ classes. 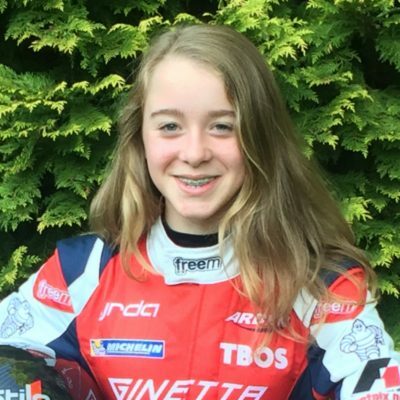 To summarise her first year in motorsport, Emily set new lap records, won 22 podiums finishes in Finals with numerous heat wins, finished 14th in the Sodi World Championship’s after competing in just half of the 24 rounds and won numerous awards such as the Buckmore Park Junior Star Pupil award in 2016 (the first girl in its then, 16 year history to have achieve this), the Jack Petchey Foundation Award for ‘Achievement in Motorsport’ and for ‘Inspiring young adults’, Highly Commended runner up for Karting Magazine’s ‘Rookie of the Year Award 2016’, Highly Commended runner up for the Active Essex ‘Young Sports Personality of the Year 2016’, and to top it all off, was then scouted by Arden International car race team to be part of their Young Racing Driver Academy (YRDA) and just one of 18 drivers worldwide. She competed in her first car race in the extremely tough Ginetta Junior Championship at Rockingham Raceway in August 2017, exactly one year on from her official MSA kart race, and scored a best result of 5th place rookie in just her second ever race meeting. She signed for Richardson Racing Team in 2018 at the ASI18 show in the NEC to race her first full season (in anything) of the Ginetta Junior Championship and had also been shortlisted for the Downforce UK ‘Henry Surtees Teen Racer of the Year Award’ too, which was being held at the same show. The public votes had been counted and the result was a landslide victory for the affable youngster, who was visibly stunned when her name was called out as the winner, she clearly wasn’t expecting to win this prestigious award. Linscott finished her first full season in racing cars in 10th place in the Ginetta Junior Rookie Championship. She has now successfully tested in the Richardson Racing Team’s British Formula 4 race car at Anglesey Circuit, where she stunned her team, her family and her coach, by jumping in t the car and immediately posting some impressive times, finishing the two days without a spin or crashes (unusual for a drivers first time in one of these cars) and now has a new focus for her career path. Miss Linscott was the proud recipient of a scholarship drive in the United States by Pippa Mann (Indy Lights Racing Driver) and the Lucas Oil School of Racing. She becomes the first driver outside of the America’s to be awarded such an opportunity. She will be mentored by Pippa herself and will drive one of the school’s open wheel Mazda powered race cars. 2019 is her GCSE year, so testing and racing will be less to ensure her exams and schooling aren’t affected in any way, but she’s aiming to be back on the grid racing in the F4 Championship, be that the British F4, F4 US or F% SEA (South East Asia), dependant on where her partners and sponsors want her to race and of course, subject to raising the budget required, as always. Such is this youngsters’ following on social media and at the racetracks, she launched her own range of Merchandise, including hats, caps, tea/coffee mugs, Ropelet bracelets, sticker sets and posters, which have sold immensely well with items being ordered and sent across the world. Emily trains at the Everyone Active Basildon Sporting Village gym and swimming pool 3-4 times a week as well as her simulator training and testing on track too, all of which have to be shoe-horned around her school work. Emily won the following awards in 2018: Everyone Active National Athlete of the Year, Everyone Active Regional Athlete of the Year (South East), Young Driver of the Year, Driver of the Year (Runner-up), Young Sports Personality of the Year (Active Basildon) and Best Fan Engagement.